Hong Kong’s highest court has declared that the three pro-democracy leaders, who were sentenced to jail last year for their role in the 2014 protests, could walk free. 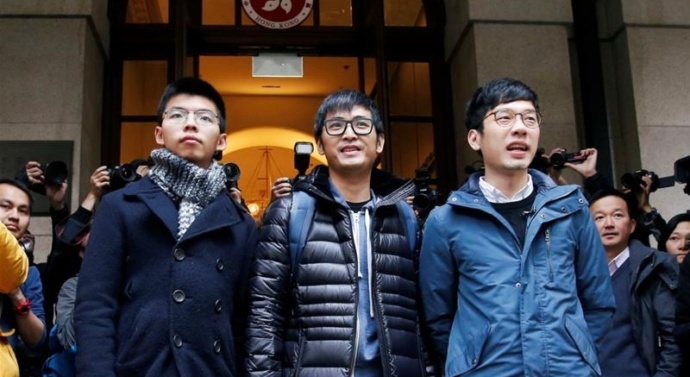 In a reversal of an August 2017 verdict, the five-member Court of Final Appeal said on Tuesday that the “sentences of imprisonment” against Joshua Wong, Nathan Law and Alex Chow are “quashed”. The highest court said the appeals court “erred in dispensing with the need to consider other sentencing options”, in meting punishment against the three. In 2016, Wong, Law and Chow were sentenced to non-jail terms, including community service for “unlawful assembly”. But Hong Kong’s Department of Justice appealed the decision, paving the way for an appeals court to order a jail term of six months for Wong, eight months for Law and seven months for Chow. The three served roughly two months of their sentences before they were allowed out on bail. The original prison sentences disqualified the three leaders from running in Hong Kong’s Legislative Council. Law, who was Hong Kong’s youngest democratically elected legislator, was also stripped of his council seat. In January, a separate court also imposed a separate three-month prison sentence against Wong for contempt. On Friday, it was learned that the three activists as well as the pro-democracy group behind the Umbrella Movement have been nominated for the 2018 Nobel Peace Prize, a first for Hong Kong. The “Umbrella Movement”, which drew hundreds of thousands of protesters at its peak, was formed after Wong and other demonstrators stormed into a courtyard fronting the city’s government headquarters in September 2014, demanding an end to China’s pre-screening of candidates for election of the region’s leader. The name of the movement arose from the use of umbrellas as a tool for peaceful resistance to the Hong Kong police during the protests. The demonstrations, which continued for almost three months, brought parts of Hong Kong to a standstill. Hong Kong, a former British colony, returned to China in 1997 under a “one country, two systems” agreement that ensured its freedoms, including a separate legal system.